Did we mention that we make our food from SCRATCH? We wanted to make food that not only tastes good, but is good for you! Call us crazy, but we make all our sauces ourselves and they're all vegetable based! You're not going to find any mayonnaise or trans fat oils in our sauces. Some of our dishes take several days to make and we even make our own kimchi! I think it's safe to say that we put some serious TLC (tender love & care) into our food. Does convenient food have to be unhealthy fast food? Does food truck food need to be unhealthy? We don't think so!! 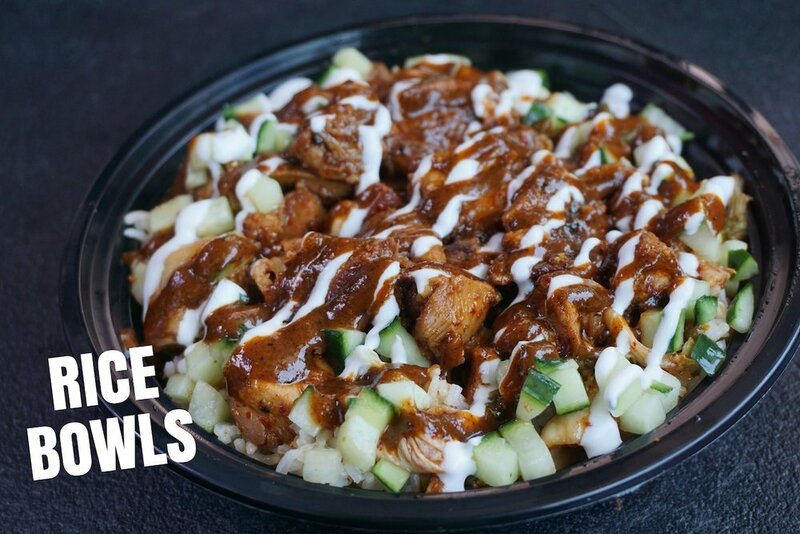 Spicy BBQ Pork Rice Bowl (Korean) -- Kimchi fried rice forms the base layer of our Korean bowls. We then top it with our spicy bbq pork, our house made kimchi, fresh cut cucumber, a touch of sour cream and our house made red pepper sauce!! Chicken Tikka Masala Burrito (Indian) -- Have you ever tried an Indian style burrito before? Before we started our business.. we never did either. This burrito is hands down our best seller and has become a household name in our business. Needless to say... it's a MUST try. Paneer Tikka Taco (Indian) -- Don't you love it when a vegetarian dish is bursting with flavor? We do too! Paneer is an Indian cheese that doesn't melt when cooked. It has a texture similar to firm tofu, and does a great job of absorbing the flavors of the Indian spiced tomato sauce we cook it in. Mushroom Tofu Rice Bowl (Korean) -- Our Korean mushroom tofu rice bowl is 100% vegetarian -- we use 4 different kinds of mushrooms to give the dish a rich umami flavor. Ask for no sour cream and this dish can be completely vegan!! Carne Asada Burrito (Mexican) -- We stuff our Mexican style burritos with our house made tomato rice, black beans, our fresh cut pico de gallo salsa, sour cream and our house made avocado green sauce!! Mix n' Match 3 Tacos -- Choose any of our 7 meat/vegetarian options to complete your set of 3 tacos! Here we are featuring our carne asada, chipotle chicken, & chicken tikka taco!! We serve all over the bay area. Find a location near you and save it on your calendar! Addresses for private catering events are not listed because, well.. they're private ;). But don't be too salty... you can host your very own private event simply by clicking here.